I have been enjoying homegrown season to the fullest this week! Tonight, our family of four celebrated a low-key Father’s day at home with bone-in ribeyes from our friend who raises our beef, Jack McCormick of Ellis Grove. Jack provides us with steers for our meat department and he produces beautifully marbled beef. The steaks were amazing but I think they were even better because of our buffet of homegrown veggies! In addition to grilled beets, potatoes and onions and the last of the season asparagus, we made a fresh garlic dressing for a greens salad. A few years ago, Chris and I took a couples cooking class at the Kitchen Conservatory in Clayton MO. We especially enjoyed the recipe for fresh garlic dressing. I have modified the recipe a bit to use honey instead of sugar and to let the fresh farm garlic really shine. I hope you will give it a try. Freshly-harvested garlic is very mild and roasting it mellows it even further. The result is a savory dressing with a hint of sweetness. 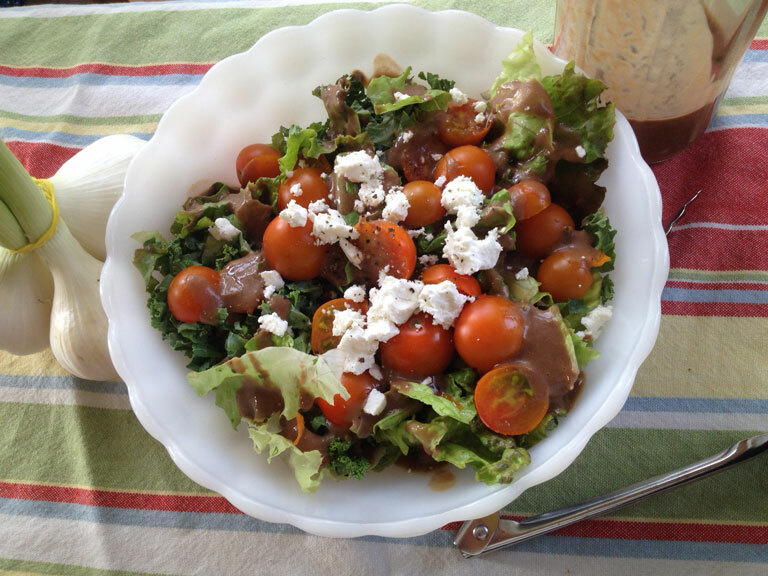 I guarantee it will become your favorite balsamic dressing of the season! Preheat oven to 450 degrees. Cut tops of garlic heads off (remove about 1/4 “ of papery tops). Place heads in an oven safe dish. Drizzle 2 Tbs olive oil over heads. Cover with foil and bake for 45 minutes. Remove garlic from oven, remove foil and allow heads to cool for 15 minutes. Squeeze cloves out of papery heads into a blender or food processor. Process or blend roasted garlic, parsley, and vinegar. Drizzle in oil. Then add honey, salt, pepper and water until well incorporated. Arrange greens in a medium bowl. Top with tomatoes and drizzle with dressing. Top with goat cheese crumbles and fresh cracked pepper. Serve immediately.